LFMN comme on le voyait avec FS98 (6ans , c'est pas si vieux, mais quels progrets depuis!! Un simeur qui ne possède QUE FS98 sur un vieux PC me demande une scène de Nice tirée de mes tiroirs, en fait j'en ai trouvée une sur Flightsim , elle est de Ethan Baker et date de février 2004!! avec textures selon photos, O4R, et ILS décalé et tout et tout , et elle est BIEN FAITE QUE pour FS98. A vos tiroirs. La vue de ci dessus est LFMN Europe2 (les anciens verseront une larme). Le read- me de la scène ci dessous , cet Auteur mérite une stèle à côté du cheval. This scenery was created from photos, and has now been updated from Jeppesen charts. ILS exists only for runways 4L and 4R (frequencies are now correct); ATIS frequency is corrected; VOR NIC has been replaced with actual VOR CGS; outer, middle and inner markers, and PAPI, are now included, as well as charts for departure procedures; runway hold lines and stopways are added. 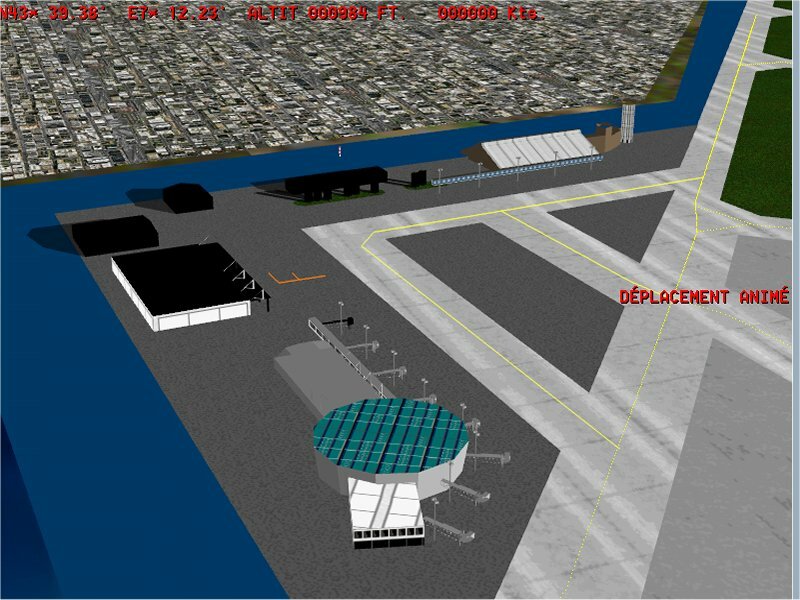 There are nine static aircraft (five of them must have scenery complexity set to 'dense' to see) and a refueling station in front of the cargo ramp (fictitious). The scenery was tested on a 400mhz, Windows 2000 system, with 196 megs of RAM and DirectX 8.1, but with no 3DFX, so I'm not sure how it may work on other systems. This scenery is freeware. It may not be sold or distributed on disk or CD without permission. All rights to these files are reserved. The materialin these files belongs to:Ethan BakerYou can use this scenery freely but there is absolutely no warranty orguarantee of any kind, expressed or implied, for any problems arising fromthe use of this scenery. 4. INSTALLATION Drop folder into main FS scenery folder and add in FS scenery library as with other add-on's. 5.THANKS Pascal Meziat and Manfred Moldenhauer for the Airport Scenery Designer, Version 2.60.